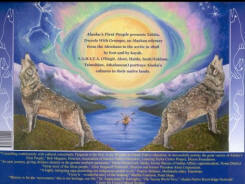 ALASKA'S FIRST PEOPLE, Travels With Grampa, the epic story of the indigenous people of Alaska in 1898. T.A.H.I.T.A. (Tlingit, Aleut, Haida, Inuit/Eskimo,Tsimshian and Athabascan) travels with his Grampa and his little fox from the Aleutians to the arctic, giving and receiving tokens. A perfect teaching tool with reinforcement on every page. 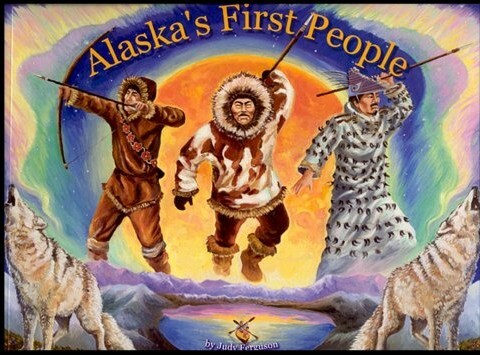 Alaska's First People by Judy Ferguson, illustrated by Nikola Kocic. Developed with indigenous leaders from each culture, Alaskas First People portrays Aleut, Sugpiag, Yupiaq, Inupiaq, Gwich'in, Koyukon, Tanacross, Ahtna and Eyak Athabascan peoples with maps on each page, glossary and a large cultural map. Alaska's First People meets the new Alaska State history requirements; lesson plans are available, based on state standards for Alaska's First People, ISBN 978-0-9716044-4-5, as well as for Alaska's Little Chief, Alaska's Secret Door, Blue Hills and Parallel Destinies. 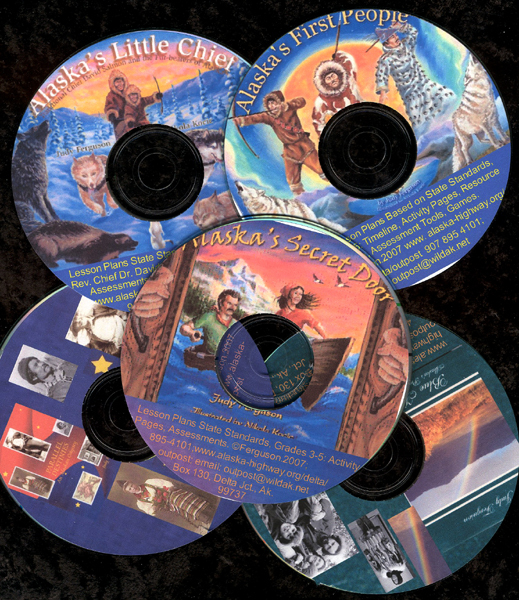 Based on State standards, lesson plans, evaluation tools, activity pages, resources, power point program for all five titles: 'Alaskas First People,' 'Alaskas Little Chief,' 'Alaskas Secret Door,' 'Parallel Destinies' and 'Blue Hills.' Printable from CDs: $8.95. Consulting continuously with cultural consultants, Ferguson is the first in my 40 years of Alaska Native education to successfully portray the great variety of Alaskas First People, Bob Maguire, Director, Association of Interior Native Educators, Learning Styles Project, Doyon Foundation. An epic journey, giving children identity in the greater northern panorama, Nettie Peratrovich, Haida, former Bureau of Indian Affairs superintendent, Nome District. A highly intriguing saga presenting our indigenous people to all, Francis Haldane, Metlakatla elder, Tsimshian. Great story of the Aleut people, Alice Snigaroff Petrovelli, Former President Aleut Corporation. I love itwonderful story of the Inupiaq! Martha Frankson, Point Hope. History is for the newcomers; this is our heritage, our life. Dr. Angayuqaq O. Kawagley, "The Yupiaq World View"-- Alaska Native Knowledge Network/Center for Cross-Cultural Studies. prints from Alaska's First People. Great thanks to indigenous leaders and educators: Dr. Angayuqaq O. Kawagley, "The Yupiaq World View: A Pathway to Ecology and Spirit," Dr Ray Barnhardt, Alaska Native Knowledge Network/Center for Cross-Cultural Studies; Crystal (Anastasia) Dushkin/Kdam Idigaa, Aleutian Pribilof Islands Association, Inc; Alice Snigaroff Petrovelli, director/former president Aleut Corporation; Bruce Richardson, Koniaq; Robert Henrichs, Sukpiaq; William Jackson, Frank Peratrovich, Tlingit; Ruby Hollembeck, Caroline Atuk Derrick, Martha and Ira Frankson, Inupiaq; Tanana Chiefs Conference First Traditional Chief David Salmon, Gwich'in Athabascan; Jerry Lipka, Professor Education and Barbara Adams, UAF; Fredrick George, Akiachak elder; Jerah Chadwich, UAF Aleutians Program; Kris Ann Mountain and Kristy Nicholas, Interior Aleutians Campus/Nulato; Barbara Dalke, retired Native educator; Jerry Isaac, Tanana Chiefs Conference president; Kenny Thomas, Tanacross elder; Fred John Jr., Old Minto Family Recovery Camp; Michelle Anderson, Ahtna Development Corporation; Johnny Goodlataw, Lisa Yoshimoto, Ahtna Athabascan; Virginia Lacy, Eyak elder; Mentasta Writers Conference; Dr. Michael Krauss Alaska Native Language Center, map, "Native Peoples and Languages of Alaska." 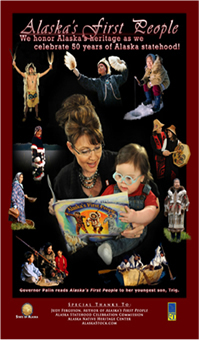 Sarah Palin reads Alaska’s First People to her son, Trig.